Durable and built to last, these new jacks are designed to make lightwork of heavy lifting and are well-suited for commercial and agricultural vehicles as well as heavy plant machinery. First up is the 50 Tonne Pneumatic Jack (stock no: 02081), a twin stage jack, capable of lifting 50 Tonnes. It features a three-stage adjustable ergonomic handle, which is fixed with a "Slow Down"valve and a "Self-Return"switch for increased safety and easy use. It also comes fitted with chrome plated cylinders and industrial quality seals prolonging the life of the jack. Plus, there is a safety overload valve and twin rubber coated wheels for a quieter and smoother operation, whilst also preventing damage to garage floors and improving manoeuvrability. The jack comes with 45mm and 75mm height lift extensions and a 1/4â€ BSP airline connector. The 40 Tonne Pneumatic Jack (stock no: 02079), features all the same great features as the 50 Tonne model but is suitable for quick and efficient lifting of loads up to 40 Tonnes. 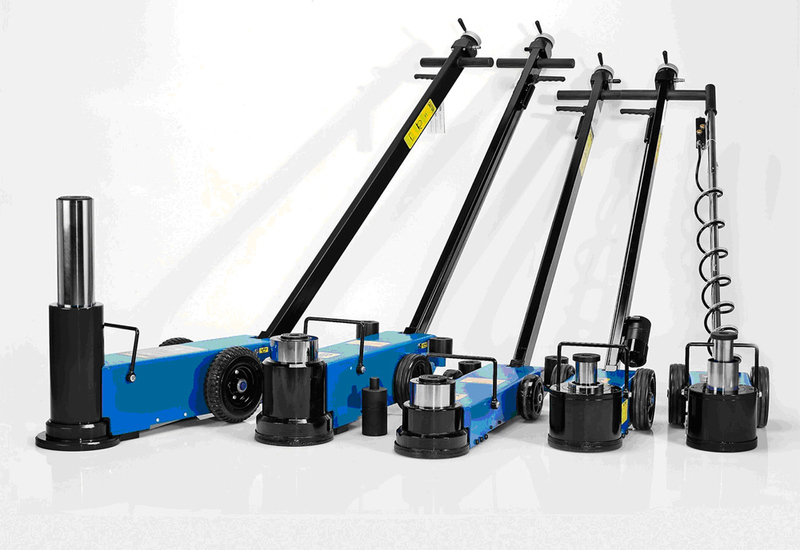 The same goes for the handy 30 Tonne Pneumatic Jack (stock no: 03724), a lightweight, compact jack, lifting up to 30 Tonnes, that's easy to store and manoeuvre. When you need some extra height, for instance when lifting tractors or heavy plant machinery, there is the new 30 Tonne Pneumatic High Lift Jack (stock no: 02078), capable of lifting 30 Tonne loads up to 772mm high. Like the others in the range it's portable and compact, with the same convenient features. For extra height it comes with 45mm and 100mm height lift extensions, and of course a 1/4â€ BSP airline connector too. There is also the 40 Tonne Pneumatic Long Chassis Low Profile Jack (stock no: 02080), which features an extra low profile, with just 125mm entry height. It has a total reach of 2210mm and is capable of lifting 40 Tonnes. Just like the others, this jack also features the same three-stage adjustable handle switch, the safety overload valve, twin rubber coated wheels, plus the 45mm and 75mm height lift extensions and 1/4â€ BSP airline connector. Every jack in the new Draper Expert pneumatic range is manufactured, tested and certified to the current EN1494 standard and guaranteed to be durable and reliable. For more information on this new range and the many other automotive and agricultural essentials available from Draper Tools visit http://www.drapertools.com.